Following its weekend split with Vermont, BU dropped one slot to 12th in the USCHO weekly poll. It was just the reverse in the USA Today/USA Hockey Magazine poll where the Terriers jumped up one spot to 11th. Assistant captain Matt Lane, freshman Jordan Greenway, and sophomore Brandon Fortunato (photo) were named to Hockey East’s Weekly Top Performers list. Lane scored a goal in Friday’s game and had a goal and two assists in Saturday’s win. Greenway assisted on both Lane goals and on a third score while Fortunato had a four-point weekend (1G, 3A). 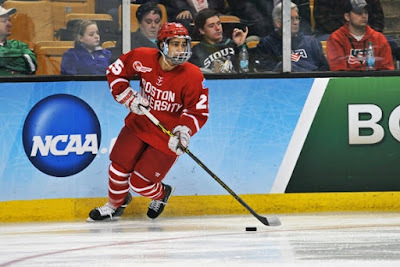 Fortunato and freshman Charlie McAvoy are the current Terriers named to the US junior national team’s preliminary camp roster and they’ll be joined by 2016 recruits Clayton Keller, Kieffer Bellows and Chad Krys. Team USA’s camp will be held at BU’s Walter Brown Arena from December 14-18, before the team departs for Helsinki, Finland and the IIHF World Junior Championships in Helsinki, Finland, beginning December 26. Former Terrier assistant coach Ben Smith will be assisting the USA Hockey staff with player evaluations at the selection camp. Once again the NHL Network will broadcast all Team USA games at the WJCs. Freshman forward Jakob Forsbacka Karlsson is one of three NCAA players named to Sweden’s preliminary roster for the WJCs. With 14 points (4G, 10A) in 16 games, the Stockholm native is tied for third among Terrier scorers. THFB previously reported that sophomore Brandon Hickey will attend Team Canada’s selection camp in Etobicoke, Ontario. 2017 recruit Patrick Harper scored two goals and added a pair of assists in Avon Old Farms first two games, a 5-3 win over Albany Academy and a 4-2 loss to Cushing Academy. Harper, a co-captain this season, led the Winged Beavers in scoring in 2014-15 with a 20-27-47 line in 22 games. 2018 recruit Tyler Weiss scored a pair of goals in the Don Mills Flyers’ 6-0 blanking of the North York Rangers. The North Carolina native has 11 goals and nine assists in 12 games. 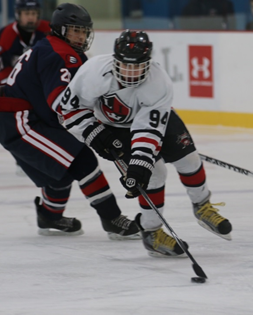 2019 recruit Robert Mastrosimone (photo) has a team-high 35 goals, along with 33 assists, for the Shattuck St. Mary’s Bantams. The East Islip, NY native is second in overall scoring for the undefeated Sabres, who are the top-ranked Tier 1 Bantam team in the country. Robert Mastrosimone, SSM - besides the obvious front three of Silianoff, Norman and Streeter, Mastrosimone was a standout for the Sabres. The recent commit to Boston University shows amazing skill with the puck and an uncanny balance with and without the puck. Listed at five foot seven and 135 pounds, Mastrosimone was rarely knocked from the puck or ever knocked down. He also delivers much harder and effective body checks than your average 135 pound player. Jack Eichel’s team-leading ninth goal of the season gave Buffalo an early lead over Edmonton, but the Oilers came back to double up the Sabres, 4-2. Former Terrier John Hynes, the NHL's youngest head coach, has led the New Jersey Devils' turnaround and is exceeding expectations, according to USA Today's Kevin Allen. Senior assistant captain Sarah Lefort had a hand in all four Terriers goals in a 4-3 win against UConn on Sunday at Walter Brown Arena. Lefort assisted on a Kayla Tutino goal and scored an unassisted shorthander to give BU a 2-1 lead after one that was stretched to 3-1 on Victoria Bach’s 11th goal early in the second. The Huskies chipped away, first cutting the margin to one and then tying the score midway through the final period, before Lefort scored the game-winner off passes from Tutino and Bach. Goalie Erin O’Neil made 20 saves to gain her eighth win of the season.